Inside readers will find books treasured by users of the great library at Hogwarts School for Witchcraft and Wizardry: Fantastic Beasts and Where to Find Them, Newt Scamander's master work on magical creatures; Quidditch Through the Ages, a comprehensive history of the game and its rules; and The Tales of Beedle the Bard, with an introduction and illustrations by J.K. Rowling and extensive commentary by Albus Dumbledore. 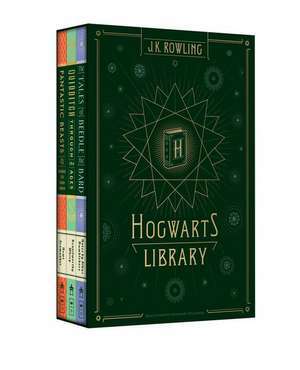 This boxed set is an essential addition to the collection of any Harry Potter fan, and a beautiful gift to cherish. From every sale of the Hogwarts Library, Scholastic will donate twenty percent of the retail sales price less taxes of this boxed set to two charities selected by the author J.K. Rowling: Lumos, a charity founded by J.K. Rowling which works to end the institutionalization of children (wearelumos.org), and Comic Relief, a UK-based charity that strives to create a just world free from poverty (www.comicrelief.com).